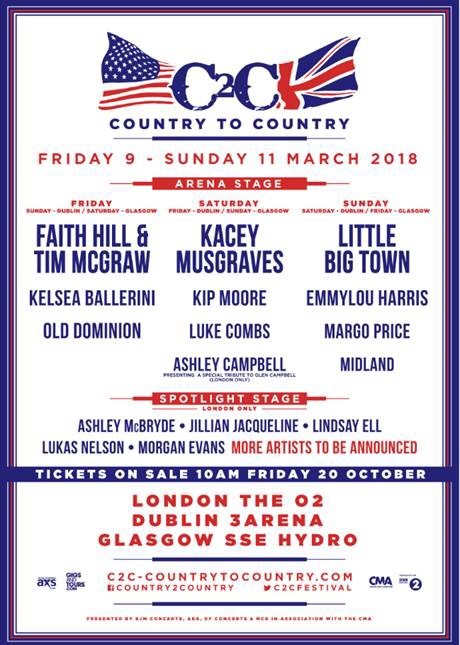 The day splits for C2C have now been announced alongside news that Morgan Evans and Ashley Campbell are confirmed to play the festival in London on 9 – 11th March 2018. Ashley will be performing and paying tribute to her father, the late Glen Campbell. Tickets go on general sale at 10am on Friday 20th October from: http://www.axs.com/c2c / 08448 24 48 24 and http://www.gigsandtours.com / 0844 811 0051. Tickets for Dublin will be available at http://www.ticketmaster.ie and Glasgow http://www.gigsinscotland.com / 08444 999 990.